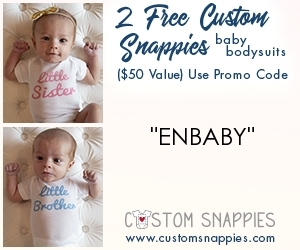 2 Free Custom Snappies Baby Bodysuits !! just pay shipping !!! FREEBIE Alert !!! Score 2 Free Custom Snappies Baby Bodysuits !! just pay shipping !!! use code : ENBABY at checkout !! $5 OFF any Atkins Product and FREE Quick Start Kit !!! Send a Friend a Free KIND Snack Bar !!! Free Order of Chips & Guac at Chipotle! Ozark Trail Weatherbuster 9 Person Dome Tent with Two Bonus Queen Airbeds Value Bundle for just $113.94 !!! Sharpie 32707 Retractable Permanent Markers, Fine Point, Assorted Colors, 12 Count for just $14.43 !!! reg price $33 ! !